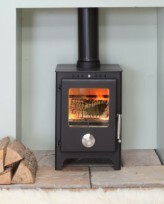 The Mendip family is the flagship of the Mendip Stoves range, built in Britain the Mendip range brings traditional looks, efficient multi fuel chambers and durability directly into your home. 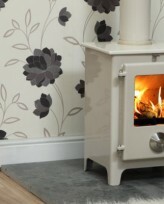 Consisting of two output sizes, 5 and 8kW as well as enamel finishes, pedestal log stores and even boiler models there is sure to be a member of the Mendip family that suits your needs. The Mendip 5 with its traditional yet simple styling has a low output is small in size and is perfect for use in existing fireplaces or places where space is at a premium but you don’t want to compromise on quality. 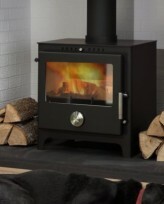 Its multi fuel chamber allows you to burn wood and smokeless fuels easily with complete control and a brilliant view of the flames at all times, and with its cast riddling grate cleaning and maintenance will be a breeze as well.